Seattle WA’s Kirby Krackle is a self-proclaimed “nerd-rock” band. Their song topics range from specific characters like Wolverine, Mega Man, and Green Lantern to more universal themes of love, destiny, and comics. 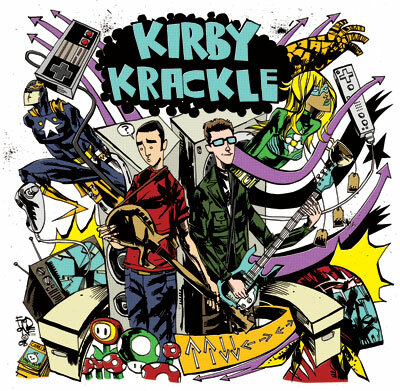 Celebrating the release of their third album “Super-Powered Love,” Kirby Krackle recently played this year’s New York Comic Con, where their set featured an impromptu marriage proposal between 2 fans. I caught up with Jim Demonakos and Kyle Stevens, the dynamic duo (gee, I bet they’ve never heard that before) behind the geek-tastic tunes. Previous songs had specific topics like Mario Kart, Green Lantern, etc. This third album feels less focused on specific nerd-doms, and seems more intent on showcasing the life of nerds. JD: We did a lot of the character-driven stuff with [2nd album] “E For Everyone.” We had “Ring Capacity,” which is so weird because it came out two and a half years ago. It got a second life on “E For Everyone.” We wanted to do some general “nerd-celebration” stuff on this one. Do you have any B-sides or songs that you might include on future albums? KS: There were a couple of songs that didn’t fit the theme of the album, like a sea shanty called “All the Heroes Are Dead.” It’s a celebration from the villains’ point-of-view and it might come out at some point. JD: We have an “X-Men” song we like that, acoustically, didn’t fit with what we were going for. We’ll do something cool with that in the near future…that’s nice and vague for you [Laughs]. Stay up to date on all things Kirby Krackle at www.kirbykracklemusic.com. “Super Powered Love” is available now. Order it on CD or at iTunes or Bandcamp!